Gold price stayed unchanged yesterday and today traders are waiting for the US Federal Reserve announcement. 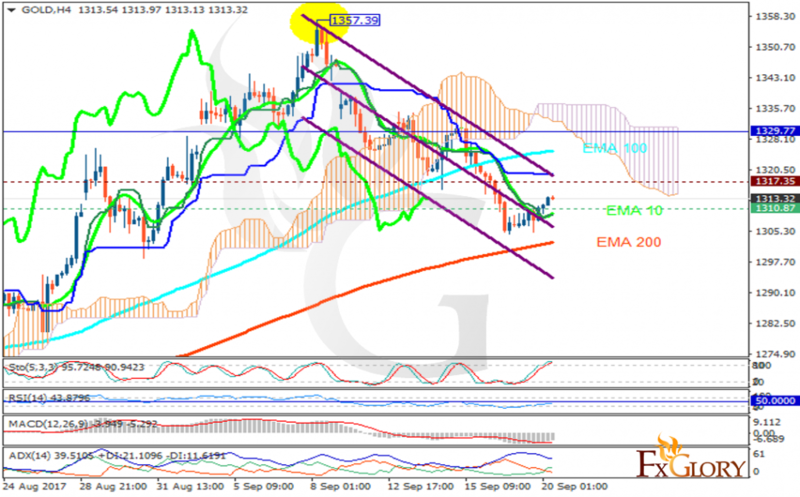 The support rests at 1310.87 with resistance at 1317.35 which both lines are below the weekly pivot point at 1329.77. The EMA of 10 is moving with bearish bias along the descendant channel and it is above the EMA of 200 and below the EMA of 100. The RSI is moving below the 50 level, the Stochastic is moving in high ranges and the MACD indicator is in negative territory. The ADX is showing weak buy signals. The price is below the Ichimoku Cloud and below the Chinkou Span. The Tenkan-sen is showing an upward trend while the Kijun-sen is showing a horizontal trend. While Gold price direction depends on the US Federal Reserve announcement, at the moment, sellers can target 1300.